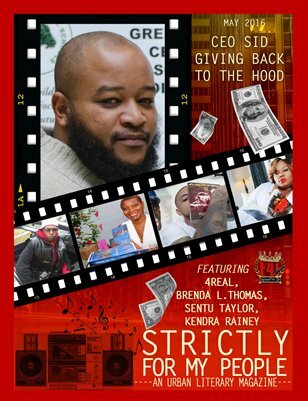 This is the second issue of Strictly for My People: An Urban Literary Magazine. It is geared toward today's hottest Urban fiction authors (amongst other genres as well). We feature Essence Best Selling Author Brenda L. Thomas, NAACP award winning author Eartha Watts- Hicks and contributing articles from Best Selling Authors Sentu Taylor and Ceo Sid. They focus on empowering us with knowledge. We'll also feature an article from a dope aspiring author by the name of Kidd Synsation. Finally, a juicy tidbit to wet your pallets for a few whom may have felt left out the first issue, this issue (and ongoing issues) will feature a poetry corner. Thank you for your interest and all support. Spread the word and let your voices be heard by contributing your talent. Details can be found inside for those who want to pursue this matter.